BioWare have finally let us in on what on Earth Shadow Realms is. It’s a co-operative online RPG inspired by pen-and-paper RPGs, from the Austin studio behind SWTOR. And it is on Earth: set in both a fantasy realm and a demon-infused but contemporary real world populated by “heroes who wouldn’t look out of place in this room”. “So much of what inspired the great BioWare games was rooted in pen and paper RPGs,” said BioWare Austin GM Jeff Hickman at EA’s GamesCom briefing. Shadow Realms was conceived as an “attempt to capture the magical feeling” of sitting around a table, as a Game Master “authored an ever-changing adventure before your eyes”. It’s wound up as a dynamic, co-operative 4 vs 1 game. Four players will control gifted teens, and a fifth will be the enemy: a “malevolent force” called the Shadowlord, entasked with possessing, entrapping and destroying his opponents with an “insidious power”. The Shadowlord can control creatures, set traps and alter the environment around his opponents. “Fight as a modern-day Hero who suddenly awakens with magical powers and is pulled into a dark realm and centuries old battle,” write BioWare. “Team up with three other Heroes in adventures facing off against a fantastic array of demonic bosses and supernatural creatures in a raging war against the Shadow Legions to save all of humanity. It sounds more like Left 4 Dead’s versus mode than anything in BioWare’s past – but Hickman promises this is a “story-driven” game. BioWare Austin will continuously tell the story of its “modern fantasy realm” with cliffhanger narrative updates, released episodically “like a TV series”. “Each new episode will be experienced together by community as it’s released,” said Hickman, who called Shadow Realms “our next great story-driven RPG”. Other steadfast RPG elements include an experience and progression system, “whether you’ve chosen good or evil”. And there’ll apparently be enough choice and consequence that each trip will be different. 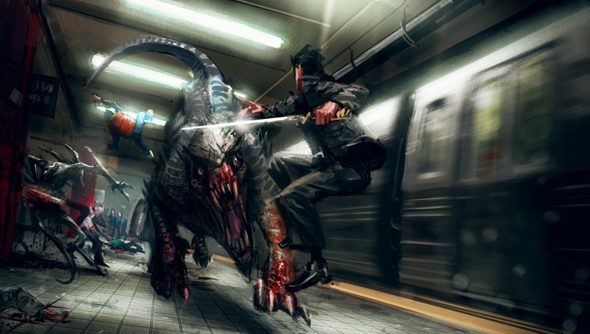 Shadow Realms is a PC game, out late next year. In the meantime, we can sign up for next month’s closed alpha on the official Shadow Realms site. What do you make of all this, then?